Neuromyelitis optica (NMO), also known as Devic's disease or Devic's syndrome, is a heterogeneous condition consisting of the inflammation and demyelination of the optic nerve (optic neuritis) and the spinal cord (myelitis). It can be monophasic or recurrent. Currently at least three different kinds are proposed based on the presence of autoantibodies thought to produce the disease: anti-AQP4, anti-MOG and anti-NF. All the cases are considered autoimmune diseases. Spinal cord lesions lead to varying degrees of weakness or paralysis in the legs or arms, loss of sensation (including blindness), and/or bladder and bowel dysfunction. Devic's disease is now studied along a collection of similar diseases called "Neuromyelitis optica spectrum diseases". The main symptoms of Devic's disease are loss of vision and spinal cord function. Optic neuritis may manifest as visual impairment with decreased visual acuity, although visual field defects, or loss of color vision may occur in isolation or prior to formal loss of acuity. Spinal cord dysfunction can lead to muscle weakness, reduced sensation, or loss of bladder and bowel control. The typical patient has an acute and severe spastic weakness of the legs (paraparesis) or all four limbs (quadriparesis) with sensory signs, often accompanied by loss of bladder control. A first subset of patients is anti-AQP4+. In them, the cause of the neuromyelitis optica (understood as the syndrome) is an autoimmune aquaporin-4 channelopathy, due to these specific autoantibodies. In these cases, astrocytes are the victims of the autoimmune attack. In a third subset of patients, NMO is due to the presence of anti-neurofascin (anti-NF) auto-antibodies which damage the Ranvier nodes of the neurones. These antibodies are more related to the peripheral nervous demyelination, but they were also found in NMO. It is not excluded the possibility that new kinds of autoantibodies could appear in NMO. 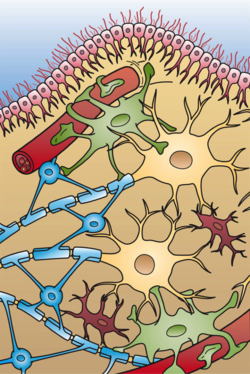 In the AQP4+ cases, these auto-antibodies target the protein aquaporin 4 in the cell membranes of astrocytes which acts as a channel for the transport of water across the cell membrane. In any case, the anti-AQP4 generation is produced mainly intrathecally. Aquaporin 4 is found in the astrocytes that surround the blood–brain barrier (BBB), a system responsible for preventing substances in the blood from crossing into the brain. The blood–brain barrier is weakened in Devic's disease, but it is currently unknown how the auto-antibodies cross the BBB. Some reports point to the metalloproteinase-2 and interleukin-6 as culprits for the BBB failure. There is broad consensus that AQP4/NMO-IgG initially enters the brain via BBB-deficient sites such as area postrema, where access to CSF occurs. There are "normal appearing areas" in NMO but compared to patients with MS, NAWM damage is less extensive. Most research into the pathology of Devic's disease has focused on the spinal cord. The damage can range from inflammatory demyelination to necrotic damage of the white and grey matters. The inflammatory lesions in Devic's disease have been classified as type II lesions (complement-mediated demyelinization), but they differ from MS pattern II lesions in their prominent perivascular distribution. Therefore, the pattern of inflammation is often quite distinct from that seen in MS.
About the presence of anti-AQP4 autoantibodies, some researchers have pointed out that some other cases could be paraneoplastic. It seems also clear that lupus can produce NMO-IgG autoantibodies sometimes, leading to some cases of lupus-derived NMO. AQP4+ NMO is the most common and is considered an autoimmune astrocytopathy or autoimmune astrocytic channelopathy) in which a person's own immune system attacks the astrocytes of the optic nerves and spinal cord. In Anti-AQP4 positive variants, CNS astrocytes, which are the basis for the glymphatic system are the target of the autoimmune attack. NMO-IgG-negative cases are less understood. It seems currently that astrocytes are spared in these IgG negative cases. Currently, the second most documented auto-antibody in NMO is anti-MOG autoantibody. MOG antibodies are currently considered mostly absent in similar diseases like multiple sclerosis. Therefore, it can be said that anti-MOG is a group contained inside AQP-Negative NMO. Together with the anti-AQP4 they form the wider part of the NMO spectrum. They classify the NMO cases in four classes, according to the presence or absence of any of these two main auto-antibodies. The clinical course and the response to therapy is different for these groups, showing a better prognosis for those in the NMO-Ab(−)/MOG-Ab(−) group, and a worse prognosis for those in the NMO-Ab(+)/MOG-Ab(+) group. The MOG-related neuromyelitis optica can be radiologically identified by the conus involvement. Myelin-oligodendrocyte glycoprotein antibody–positive patients were more likely to have conus involvement on spinal magnetic resonance imaging. NF auto antibodies can also appear in NMO cases. These antibodies are more related to the peripheral nervous demyelination, but they were also found in NMO. Since the discovery of AQP4 autoantibody, it has been found that it appears also in patients with NMO-like symptoms that do not fulfill the clinical requirements to be diagnosed NMO (Recurrent and simultaneous optic nerve and spinal cord inflammation). The term NMOSD (NMO Spectrum Disorders) has been designed to allow incorporation of cases associated a non-AQP4 biomarkers. Therefore, it includes all the clinical variants due to anti-AQP4 plus other non-related but clinically similar syndromes like antiMOG associated encephalomyelitis. Some cases with MOG+ and AQP4+ antibodies have been found. The collection of these condition has been named "neuromyelitis optica spectrum disorders" (NMSD) and they are expected to respond to the same treatments as standard NMO. Some authors propose to use the name "autoimmune aquaporin-4 channelopathy" for these diseases, while others prefer a more generic term "AQP4-astrocytopathy" that includes also problems in AQP4 with a non-autoimmune origin. Asian optic-spinal MS—this variant can present brain lesions like MS.
NMO-IgG negative NMO: AQP4 antibody-seronegative NMO poses a diagnostic challenge. Some cases could be related to anti-myelin oligodendrocyte glycoprotein (MOG) autoantibodies. Whether Devic's disease is a distinct disease or part of the wide spectrum of multiple sclerosis is debated. Devic's disease differs in that it usually has more severe sequelae after an acute episode than standard MS, MS infrequently presents as transverse myelitis, and oligoclonal bands in the CSF, as well as white matter lesions on brain MRI, are uncommon in Devic's disease, but occur in over 90% of MS patients. Recently, AQP4 has been found to distinguish standard multiple sclerosis from neuromyelitis optica, but as MS is a heterogeneous condition, and some MS cases are reported to be Kir4.1 channelopathies (autoimmunity against the potassium channels) it is still possible to consider NMO as part of the MS spectrum. Besides, some NMO-AQP(−) variants are not astrocytopathic, but demyelinating. Tumefactive demyelinating lesions in NMO are not usual, but they have been reported to appear in several cases mistakenly treated with interferon beta. AQP4-Ab-negative NMO presents problems for diagnosis. The behavior of the oligoclonal bands respect MS[clarification needed] can help to establish a more accurate diagnosis. Oligoclonal bands in NMO are rare and they tend to disappear after the attacks, while in MS they are nearly always present and persistent. It is important to notice for differential diagnosis that, though uncommon, it is possible to have longitudinal lesions in MS.
Other problem for diagnosis is that AQP4ab in MOGab levels can be too low to be detected. Some additional biomarkers have been proposed. Currently, there is no cure for Devic's disease, but symptoms can be treated. Some patients recover, but many are left with impairment of vision and limbs, which can be severe. Attacks are treated with short courses of high dosage intravenous corticosteroids such as methylprednisolone IV. Plasmapheresis can be an effective treatment when attacks progress or do not respond to corticosteroid treatment. Clinical trials for these treatments contain very small numbers, and most are uncontrolled, though some report high success percentage. No controlled trials have established the effectiveness of treatments for the prevention of attacks. Many clinicians agree that long term immunosuppression is required to reduce the frequency and severity of attacks, while others argue the exact opposite. Commonly used immunosuppressant treatments include azathioprine (Imuran) plus prednisone, mycophenolate mofetil plus prednisone, mitoxantrone, intravenous immunoglobulin (IVIG), and cyclophosphamide. Though the disease is known to be auto-antibodies mediated, B-cell depletion has been tried with the monoclonal antibody rituximab, showing good results. Several other disease modifying therapies are being tried. In 2007, Devic's disease was reported to be responsive to glatiramer acetate and to low-dose corticosteroids. Use of Mycophenolate mofetil is also currently under research. Hematopoietic stem cell transplantation (HSCT) is sometimes used in severe cases of NMO. Currently available data suggest that this procedure can reduce inflammatory activity in the short term, but a clear majority of the patients will relapse within 5 years. Normally, some measure of improvement appears in a few weeks, but residual signs and disability may persist, sometimes severely. The disease can be monophasic, i.e. a single episode with permanent remission. However, at least 85% of patients have a relapsing form of the disease with repeated attacks of transverse myelitis and/or optic neuritis. In patients with the monophasic form, the transverse myelitis and optic neuritis occur simultaneously or within days of each other. On the other hand, patients with the relapsing form are more likely to have weeks or months between the initial attacks, and to have better motor recovery after the initial transverse myelitis event. Relapses usually occur early, with about 55% of patients having a relapse in the first year and 90% in the first five years. It is possible that the relapsing form is related to the antiAQP4+ seropositive status and the monophasic form related to its absence Unlike multiple sclerosis, Devic's disease rarely has a secondary progressive phase in which patients have increasing neurologic decline between attacks without remission. Instead, disabilities arise from the acute attacks. Approximately 20% of patients with monophasic Devic's disease have permanent visual loss, and 30% have permanent paralysis in one or both legs. Among patients with relapsing Devic's disease, 50% have paralysis or blindness within five years. In some patients (33% in one study), transverse myelitis in the cervical spinal cord resulted in respiratory failure and subsequent death. However, the spectrum of Devic's disease has widened due to improved diagnostic criteria, and the options for treatment have improved; as a result, researchers believe these estimates will be lowered. The prevalence and incidence of Devic's disease has not been established, partly because the disease is underrecognized and often confused with MS. Devic's disease is more common in women than men, with women comprising over two-thirds of patients and more than 80% of those with the relapsing form of the disease. A retrospective study found that prevalence of NMOsd was 1.5% inside a random sample of neurological patients, with a MS:NMOsd ratio of 42.7. Among 13 NMOsd patients, 77% had long spinal cord lesions, 38% had severe optic neuritis and 23% had brain or brainstem lesions. Only 56% had clinically definite NMO at follow-up. According to the Walton Centre in England, "NMO seems to be present across the world unlike MS, which has a higher incidence in temperate climates and white races. Africans and Asians especially in Far East may have a higher risk of NMO, although the exact incidence of this disease is unknown, making specific conclusions difficult". Although many people who have Devic's disease were initially misdiagnosed with MS, 35% of African Americans are often misdiagnosed with MS when they really have NMO. Devic's disease is more common in Asians than Caucasians. In fact, Asian optic-spinal MS (which constitutes 30% of the cases of MS in Japan) has been suggested to be identical to Devic's disease (differences between optic-spinal and classic MS in Japanese patients). In the indigenous populations of tropical and subtropical regions, MS is rare, but when it appears, it often takes the form of optic-spinal MS. The majority of Devic's disease patients have no affected relatives, and it is generally regarded as a nonfamilial condition. First reports on an association of spinal cord and optic nerve disorders appeared in the early 19th century. However, only an 1870 report by Sir Thomas Clifford Allbutt created sustained interest of neurologists and ophthalmologists in this rare syndrome. In 1894, Eugène Devic and his PhD student Fernand Gault described 16 patients who had lost vision in one or both eyes and within weeks developed severe spastic weakness of the limbs, loss of sensation and often bladder control. They recognized these symptoms were the result of inflammation of the optic nerve and spinal cord, respectively. Similar instances of optic neuritis and myelitis were reported, and many believed it constituted a distinct clinical entity. However, some patients had pathology in other parts of the brain, a feature which was more suggestive of acute disseminated encephalomyelitis or MS. In 2002, Mayo Clinic researchers identified an humoral mechanism, targeting a perivascular protein, as the culprit for NMO  and in 2004 an unknown specific autoantibody was found. In 2005 they identified the aquaporin 4 protein as the target of the disease, and developed a test to aid in the diagnosis of Devic's disease by detection of an antibody, NMO-IgG, in the blood. Some patients with NMO may be seronegative for NMO-IgG, whilst some patients with NMO-IgG may still not fulfill clinical criteria for NMO thus serological testing is now an important part of the diagnostic procedure and seropositive and seronegative cases are described in a manner similar to myasthenia gravis. According to the Mayo Clinic report, this was the first time a molecular target had been identified for a type of demyelinating inflammatory disease. Since the discovery of AQP-4 involvement, some research studies have focused on targeted treatment aimed at anti-aquaporin 4 antibodies. The most established method for antibody removal is plasmapheresis. A number of drugs are being studied: aquaporumab (non-pathogenic antibody blocker of AQP4-IgG binding), sivelestat (neutrophil elastase inhibitor), and eculizumab (complement inhibitor). There is little research into the primary causes of the Anti-AQP4 auto-antibodies. It has been noticed that some cases could be paraneoplastic. In addition, several NMO variants have been discovered with antibodies other than those for AQP4, turning NMO into a heterogeneous disease. Six different patterns of damage have been reported in NMO, raising the possibility of six different types of auto-antibodies. As of 2019 only three of them are known. A new auto-antibody (GFAP) was found in 2016 in transverse myelitis (LETM) and atypical NMO, leading to the concept of Autoimmune GFAP Astrocytopathy. ^ a b c d e f g h i Wingerchuk DM (May 2006). "Neuromyelitis optica". International MS Journal. 13 (2): 42–50. PMID 16635421. ^ a b c d Wingerchuk DM, Banwell B, Bennett JL, Cabre P, Carroll W, Chitnis T, de Seze J, Fujihara K, Greenberg B, Jacob A, Jarius S, Lana-Peixoto M, Levy M, Simon JH, Tenembaum S, Traboulsee AL, Waters P, Wellik KE, Weinshenker BG (July 2015). "International consensus diagnostic criteria for neuromyelitis optica spectrum disorders". Neurology. 85 (2): 177–89. doi:10.1212/WNL.0000000000001729. PMC 4515040. PMID 26092914. ^ "Neuromyelitis optica". Mayo Clinic. December 15, 2017. ^ a b Pittock SJ, Lucchinetti CF (February 2016). "Neuromyelitis optica and the evolving spectrum of autoimmune aquaporin-4 channelopathies: a decade later". Annals of the New York Academy of Sciences. 1366 (1): 20–39. doi:10.1111/nyas.12794. PMC 4675706. PMID 26096370. ^ a b Spadaro M, Gerdes LA, Mayer MC, Ertl-Wagner B, Laurent S, Krumbholz M, Breithaupt C, Högen T, Straube A, Giese A, Hohlfeld R, Lassmann H, Meinl E, Kümpfel T (March 2015). "Histopathology and clinical course of MOG-antibody-associated encephalomyelitis". Annals of Clinical and Translational Neurology. 2 (3): 295–301. doi:10.1002/acn3.164. PMC 4369279. PMID 25815356. ^ Kowarik MC, Dzieciatkowska M, Wemlinger S, Ritchie AM, Hemmer B, Owens GP, Bennett JL (January 2015). "The cerebrospinal fluid immunoglobulin transcriptome and proteome in neuromyelitis optica reveals central nervous system-specific B cell populations". Journal of Neuroinflammation. 12: 19. doi:10.1186/s12974-015-0240-9. PMC 4323273. PMID 25626447. ^ Uchida T, Mori M, Uzawa A, Masuda H, Muto M, Ohtani R, Kuwabara S (July 2017). "Increased cerebrospinal fluid metalloproteinase-2 and interleukin-6 are associated with albumin quotient in neuromyelitis optica: Their possible role on blood-brain barrier disruption". Multiple Sclerosis. 23 (8): 1072–1084. doi:10.1177/1352458516672015. PMID 27682231. ^ Mørch MT, Sørensen SF, Khorooshi R, Asgari N, Owens T (April 2018). "Selective localization of IgG from cerebrospinal fluid to brain parenchyma". Journal of Neuroinflammation. 15 (1): 110. doi:10.1186/s12974-018-1159-8. PMC 5904996. PMID 29665816. ^ Kim SH, Kwak K, Hyun JW, Joung A, Lee SH, Choi YH, Lee JM, Kim HJ (July 2017). "Diffusion tensor imaging of normal-appearing white matter in patients with neuromyelitis optica spectrum disorder and multiple sclerosis". European Journal of Neurology. 24 (7): 966–973. doi:10.1111/ene.13321. PMID 28643955. ^ a b Lucchinetti CF, Mandler RN, McGavern D, Bruck W, Gleich G, Ransohoff RM, Trebst C, Weinshenker B, Wingerchuk D, Parisi JE, Lassmann H (July 2002). "A role for humoral mechanisms in the pathogenesis of Devic's neuromyelitis optica". Brain. 125 (Pt 7): 1450–61. doi:10.1093/brain/awf151. PMC 5444467. PMID 12076996. ^ a b Iorio R, Rindi G, Erra C, Damato V, Ferilli M, Sabatelli M (May 2015). "Neuromyelitis optica spectrum disorder as a paraneoplastic manifestation of lung adenocarcinoma expressing aquaporin-4". Multiple Sclerosis. 21 (6): 791–4. doi:10.1177/1352458515572241. PMID 25716881. ^ Kovacs KT, Kalluri SR, Boza-Serrano A, Deierborg T, Csepany T, Simo M, Rokusz L, Miseta A, Alcaraz N, Czirjak L, Berki T, Molnar T, Hemmer B, Illes Z (August 2016). "Change in autoantibody and cytokine responses during the evolution of neuromyelitis optica in patients with systemic lupus erythematosus: A preliminary study". Multiple Sclerosis. 22 (9): 1192–201. doi:10.1177/1352458515613165. PMID 26514978. ^ Lucchinetti CF, Guo Y, Popescu BF, Fujihara K, Itoyama Y, Misu T (January 2014). "The pathology of an autoimmune astrocytopathy: lessons learned from neuromyelitis optica". Brain Pathology. 24 (1): 83–97. doi:10.1111/bpa.12099. PMC 3905574. PMID 24345222. ^ Pittock SJ, Weinshenker BG, Lucchinetti CF, Wingerchuk DM, Corboy JR, Lennon VA (July 2006). "Neuromyelitis optica brain lesions localized at sites of high aquaporin 4 expression". Archives of Neurology. 63 (7): 964–8. doi:10.1001/archneur.63.7.964. PMID 16831965. ^ a b Lennon VA, Kryzer TJ, Pittock SJ, Verkman AS, Hinson SR (August 2005). "IgG marker of optic-spinal multiple sclerosis binds to the aquaporin-4 water channel". The Journal of Experimental Medicine. 202 (4): 473–7. doi:10.1084/jem.20050304. PMC 2212860. PMID 16087714. ^ Ikeda K, Kiyota N, Kuroda H, Sato DK, Nishiyama S, Takahashi T, Misu T, Nakashima I, Fujihara K, Aoki M (April 2015). "Severe demyelination but no astrocytopathy in clinically definite neuromyelitis optica with anti-myelin-oligodendrocyte glycoprotein antibody". Multiple Sclerosis. 21 (5): 656–9. doi:10.1177/1352458514551455. PMID 25257613. ^ Ketelslegers IA, Van Pelt DE, Bryde S, Neuteboom RF, Catsman-Berrevoets CE, Hamann D, Hintzen RQ (October 2015). "Anti-MOG antibodies plead against MS diagnosis in an Acquired Demyelinating Syndromes cohort". Multiple Sclerosis. 21 (12): 1513–20. doi:10.1177/1352458514566666. PMID 25662345. ^ a b Pröbstel AK, Rudolf G, Dornmair K, Collongues N, Chanson JB, Sanderson NS, Lindberg RL, Kappos L, de Seze J, Derfuss T (March 2015). "Anti-MOG antibodies are present in a subgroup of patients with a neuromyelitis optica phenotype". Journal of Neuroinflammation. 12: 46. doi:10.1186/s12974-015-0256-1. PMC 4359547. PMID 25889963. ^ a b Kezuka T, Usui Y, Yamakawa N, Matsunaga Y, Matsuda R, Masuda M, Utsumi H, Tanaka K, Goto H (June 2012). "Relationship between NMO-antibody and anti-MOG antibody in optic neuritis". Journal of Neuro-Ophthalmology. 32 (2): 107–10. doi:10.1097/WNO.0b013e31823c9b6c. PMID 22157536. ^ Kitley J, Waters P, Woodhall M, Leite MI, Murchison A, George J, Küker W, Chandratre S, Vincent A, Palace J (March 2014). "Neuromyelitis optica spectrum disorders with aquaporin-4 and myelin-oligodendrocyte glycoprotein antibodies: a comparative study". JAMA Neurology. 71 (3): 276–83. doi:10.1001/jamaneurol.2013.5857. PMID 24425068. ^ Wingerchuk DM, Lennon VA, Pittock SJ, Lucchinetti CF, Weinshenker BG (May 2006). "Revised diagnostic criteria for neuromyelitis optica". Neurology. 66 (10): 1485–9. doi:10.1212/01.wnl.0000216139.44259.74. PMID 16717206. ^ a b Masaki K, Suzuki SO, Matsushita T, Matsuoka T, Imamura S, Yamasaki R, Suzuki M, Suenaga T, Iwaki T, Kira J (2013). "Connexin 43 astrocytopathy linked to rapidly progressive multiple sclerosis and neuromyelitis optica". PLOS One. 8 (8): e72919. doi:10.1371/journal.pone.0072919. PMC 3749992. PMID 23991165. ^ Fujihara K, Sato DK (October 2013). "AQP4 antibody serostatus: Is its luster being lost in the management and pathogenesis of NMO?". Neurology. 81 (14): 1186–8. doi:10.1212/WNL.0b013e3182a6cc23. PMID 23997154. ^ a b Masaki K (October 2015). "Early disruption of glial communication via connexin gap junction in multiple sclerosis, Baló's disease and neuromyelitis optica". Neuropathology. 35 (5): 469–80. doi:10.1111/neup.12211. PMID 26016402. ^ Li Y, Xie P, Lv F, Mu J, Li Q, Yang Q, Hu M, Tang H, Yi J (October 2008). "Brain magnetic resonance imaging abnormalities in neuromyelitis optica". Acta Neurologica Scandinavica. 118 (4): 218–25. doi:10.1111/j.1600-0404.2008.01012.x. PMID 18384459. ^ a b c Wingerchuk, Dean (2006). "Neuromyelitis Optica (Devic's Syndrome)" (PDF). 2006 Rare Neuroimmunologic Disorders Symposium. Archived from the original (PDF) on 2006-09-25. Retrieved 2007-01-05. ^ Fujihara K, Leite MI (June 2013). "Seronegative NMO: a sensitive AQP4 antibody test clarifies clinical features and next challenges". Neurology. 80 (24): 2176–7. doi:10.1212/WNL.0b013e318296ea22. PMID 23658387. ^ Marignier R, Bernard-Valnet R, Giraudon P, Collongues N, Papeix C, Zéphir H, Cavillon G, Rogemond V, Casey R, Frangoulis B, De Sèze J, Vukusic S, Honnorat J, Confavreux C (June 2013). "Aquaporin-4 antibody-negative neuromyelitis optica: distinct assay sensitivity-dependent entity". Neurology. 80 (24): 2194–200. doi:10.1212/WNL.0b013e318296e917. PMID 23658379. ^ Saida T (June 2008). "[Overview of MS: proposal of new MS definition/classification and review of the results of recent clinical trials]". Nihon Rinsho. Japanese Journal of Clinical Medicine (abstract). 66 (6): 1081–6. PMID 18540351. ^ Pearce JM (November 2005). "Neuromyelitis optica". Spinal Cord. 43 (11): 631–4. doi:10.1038/sj.sc.3101758. PMID 15968305. ^ Lassmann H, Brück W, Lucchinetti C (March 2001). "Heterogeneity of multiple sclerosis pathogenesis: implications for diagnosis and therapy". Trends in Molecular Medicine. 7 (3): 115–21. doi:10.1016/s1471-4914(00)01909-2. PMID 11286782. ^ Schneider R (2013). "Autoantibodies to Potassium Channel KIR4.1 in Multiple Sclerosis". Frontiers in Neurology. 4: 125. doi:10.3389/fneur.2013.00125. PMC 3759297. PMID 24032025. ^ Kurosawa K, Fujihara K (November 2014). "[Clinical concept, etiology and pathology of neuromyelitis optica]". Nihon Rinsho. Japanese Journal of Clinical Medicine. 72 (11): 1897–902. PMID 25518368. ^ Harmel J, Ringelstein M, Ingwersen J, Mathys C, Goebels N, Hartung HP, Jarius S, Aktas O (December 2014). "Interferon-β-related tumefactive brain lesion in a Caucasian patient with neuromyelitis optica and clinical stabilization with tocilizumab". BMC Neurology. 14: 247. doi:10.1186/s12883-014-0247-3. PMC 4301061. PMID 25516429. ^ Bergamaschi R, Tonietti S, Franciotta D, Candeloro E, Tavazzi E, Piccolo G, Romani A, Cosi V (February 2004). "Oligoclonal bands in Devic's neuromyelitis optica and multiple sclerosis: differences in repeated cerebrospinal fluid examinations". Multiple Sclerosis. 10 (1): 2–4. doi:10.1191/1352458504ms988oa. PMID 14760945. ^ Komatsu J, Sakai K, Nakada M, Iwasa K, Yamada M (August 2017). "Long spinal cord lesions in a patient with pathologically proven multiple sclerosis". Journal of Clinical Neuroscience. 42: 106–108. doi:10.1016/j.jocn.2017.03.022. PMID 28465080. ^ Arru G, Sechi E, Mariotto S, Farinazzo A, Mancinelli C, Alberti D, Ferrari S, Gajofatto A, Capra R, Monaco S, Deiana GA, Caggiu E, Mameli G, Sechi LA, Sechi GP (2017). "Antibody response against HERV-W env surface peptides differentiates multiple sclerosis and neuromyelitis optica spectrum disorder". Multiple Sclerosis Journal - Experimental, Translational and Clinical. 3 (4): 2055217317742425. doi:10.1177/2055217317742425. PMC 5703109. PMID 29204291. ^ Jurynczyk M, Probert F, Yeo T, Tackley G, Claridge TD, Cavey A, Woodhall MR, Arora S, Winkler T, Schiffer E, Vincent A, DeLuca G, Sibson NR, Isabel Leite M, Waters P, Anthony DC, Palace J (December 2017). "Metabolomics reveals distinct, antibody-independent, molecular signatures of MS, AQP4-antibody and MOG-antibody disease". Acta Neuropathologica Communications. 5 (1): 95. doi:10.1186/s40478-017-0495-8. PMC 5718082. PMID 29208041. ^ Morgan SM, Zantek ND, Carpenter AF (June 2014). "Therapeutic plasma exchange in neuromyelitis optica: a case series". Journal of Clinical Apheresis. 29 (3): 171–7. doi:10.1002/jca.21304. PMID 24136389. ^ Poser CM, Brinar VV (October 2007). "Disseminated encephalomyelitis and multiple sclerosis: two different diseases - a critical review". Acta Neurologica Scandinavica. 116 (4): 201–6. doi:10.1111/j.1600-0404.2007.00902.x. PMID 17824894. ^ Weinstock-Guttman B, Ramanathan M, Lincoff N, Napoli SQ, Sharma J, Feichter J, Bakshi R (July 2006). "Study of mitoxantrone for the treatment of recurrent neuromyelitis optica (Devic disease)". Archives of Neurology. 63 (7): 957–63. doi:10.1001/archneur.63.7.957. PMID 16831964. ^ Matiello M, Jacob A, Wingerchuk DM, Weinshenker BG (June 2007). "Neuromyelitis optica". Current Opinion in Neurology. 20 (3): 255–60. doi:10.1097/WCO.0b013e32814f1c6b. PMID 17495617. ^ Evangelopoulos ME, Andreadou E, Koutsis G, Koutoulidis V, Anagnostouli M, Katsika P, Evangelopoulos DS, Evdokimidis I, Kilidireas C (January 2017). "Treatment of neuromyelitis optica and neuromyelitis optica spectrum disorders with rituximab using a maintenance treatment regimen and close CD19 B cell monitoring. A six-year follow-up". Journal of the Neurological Sciences. 372: 92–96. doi:10.1016/j.jns.2016.11.016. PMID 28017256. ^ Gartzen K, Limmroth V, Putzki N (June 2007). "Relapsing neuromyelitis optica responsive to glatiramer acetate treatment". European Journal of Neurology. 14 (6): e12–3. doi:10.1111/j.1468-1331.2007.01807.x. PMID 17539924. ^ Watanabe S, Misu T, Miyazawa I, Nakashima I, Shiga Y, Fujihara K, Itoyama Y (September 2007). "Low-dose corticosteroids reduce relapses in neuromyelitis optica: a retrospective analysis". Multiple Sclerosis. 13 (8): 968–74. doi:10.1177/1352458507077189. PMID 17623727. ^ Montcuquet A, Collongues N, Papeix C, Zephir H, Audoin B, Laplaud D, Bourre B, Brochet B, Camdessanche JP, Labauge P, Moreau T, Brassat D, Stankoff B, de Seze J, Vukusic S, Marignier R (September 2017). "Effectiveness of mycophenolate mofetil as first-line therapy in AQP4-IgG, MOG-IgG, and seronegative neuromyelitis optica spectrum disorders". Multiple Sclerosis. 23 (10): 1377–1384. doi:10.1177/1352458516678474. PMID 27885065. ^ Burman J, Tolf A, Hägglund H, Askmark H (February 2018). "Autologous haematopoietic stem cell transplantation for neurological diseases". Journal of Neurology, Neurosurgery, and Psychiatry. 89 (2): 147–155. doi:10.1136/jnnp-2017-316271. PMC 5800332. PMID 28866625. ^ Ketelslegers IA, Modderman PW, Vennegoor A, Killestein J, Hamann D, Hintzen RQ (December 2011). "Antibodies against aquaporin-4 in neuromyelitis optica: distinction between recurrent and monophasic patients". Multiple Sclerosis. 17 (12): 1527–30. doi:10.1177/1352458511412995. PMID 21828202. ^ Bizzoco E, Lolli F, Repice AM, Hakiki B, Falcini M, Barilaro A, Taiuti R, Siracusa G, Amato MP, Biagioli T, Lori S, Moretti M, Vinattieri A, Nencini P, Massacesi L, Matà S (November 2009). "Prevalence of neuromyelitis optica spectrum disorder and phenotype distribution". Journal of Neurology. 256 (11): 1891–8. doi:10.1007/s00415-009-5171-x. PMID 19479168. ^ Cabre P, Signate A, Olindo S, Merle H, Caparros-Lefebvre D, Béra O, Smadja D (December 2005). "Role of return migration in the emergence of multiple sclerosis in the French West Indies". Brain. 128 (Pt 12): 2899–910. doi:10.1093/brain/awh624. PMID 16183661. ^ a b Jarius S, Wildemann B (January 2013). "The history of neuromyelitis optica". Journal of Neuroinflammation. 10 (1): 8. doi:10.1186/1742-2094-10-8. PMC 3599417. PMID 23320783. ^ Jarius S, Wildemann B (January 2013). "On the contribution of Thomas Clifford Allbutt, F.R.S., to the early history of neuromyelitis optica". Journal of Neurology. 260 (1): 100–4. doi:10.1007/s00415-012-6594-3. PMID 22782261. ^ Devic E (1894). "Myélite subaiguë compliquée de névrite optique" [Subacute myelitis complicated with optic neuritis]. Bull Med (in French). 8: 1033. ^ T. Jock Murray (2005). Multiple Sclerosis: The History of a Disease. New York: Demos Medical Publishing. ISBN 978-1-888799-80-4. ^ Lennon VA, Wingerchuk DM, Kryzer TJ, Pittock SJ, Lucchinetti CF, Fujihara K, Nakashima I, Weinshenker BG (2004). "A serum autoantibody marker of neuromyelitis optica: distinction from multiple sclerosis". Lancet. 364 (9451): 2106–12. doi:10.1016/S0140-6736(04)17551-X. PMID 15589308. ^ "Devic's Disease Research – Mayo Clinic". Archived from the original on 2009-02-16. ^ Papadopoulos MC, Verkman AS (June 2012). "Aquaporin 4 and neuromyelitis optica". The Lancet. Neurology. 11 (6): 535–44. doi:10.1016/S1474-4422(12)70133-3. PMC 3678971. PMID 22608667. ^ Misu T, Höftberger R, Fujihara K, Wimmer I, Takai Y, Nishiyama S, Nakashima I, Konno H, Bradl M, Garzuly F, Itoyama Y, Aoki M, Lassmann H (June 2013). "Presence of six different lesion types suggests diverse mechanisms of tissue injury in neuromyelitis optica". Acta Neuropathologica. 125 (6): 815–27. doi:10.1007/s00401-013-1116-7. PMC 3661909. PMID 23579868. ^ Hahn S, Trendelenburg G, Scharf M, Denno Y, Brakopp S, Teegen B, Probst C, Wandinger KP, Buttmann M, Haarmann A, Szabados F, Vom Dahl M, Kümpfel T, Eichhorn P, Gold H, Paul F, Jarius S, Melzer N, Stöcker W, Komorowski L (June 2017). "Identification of the flotillin-1/2 heterocomplex as a target of autoantibodies in bona fide multiple sclerosis". Journal of Neuroinflammation. 14 (1): 123. doi:10.1186/s12974-017-0900-z. PMC 5481867. PMID 28645295.